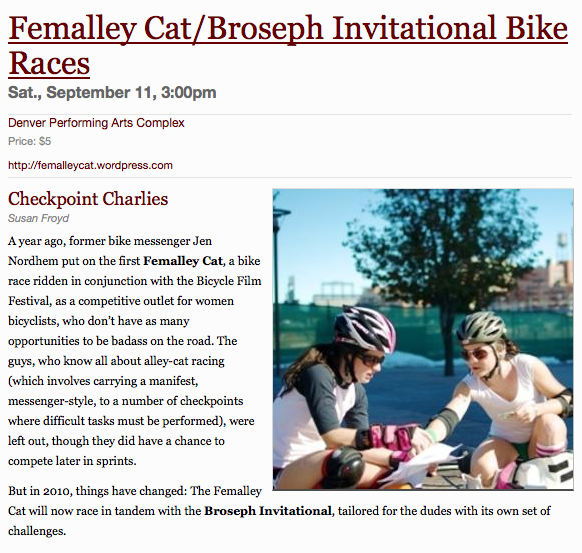 The Femalley Cat | A RACE TO CELEBRATE WOMEN AND SHOW THE BOYS HOW IT'S DONE! Thanks to the Westword for the coverage! This is the exact manifest that you will be racing with tomorrow, Saturday, September 11. Show up at 3pm with your $5, ready to race!!! We can’t wait! Have questions? Check the FAQ page first. The Femalley Cat is THIS Saturday, September 11th! But you know probably already knew that cuz its been on your calendars for weeks by now, right? $5 to register, registration starts at 3pm. We’ll be chillin’ under the dancing people aka aliens at the Center for Performing Arts on Speer Blvd, between Champa and Arapahoe. Once all you lovely ladies return, we’ll be keeping the party going with some side events, like the Lipstick Shuttle Sprint and Best Trick contest. 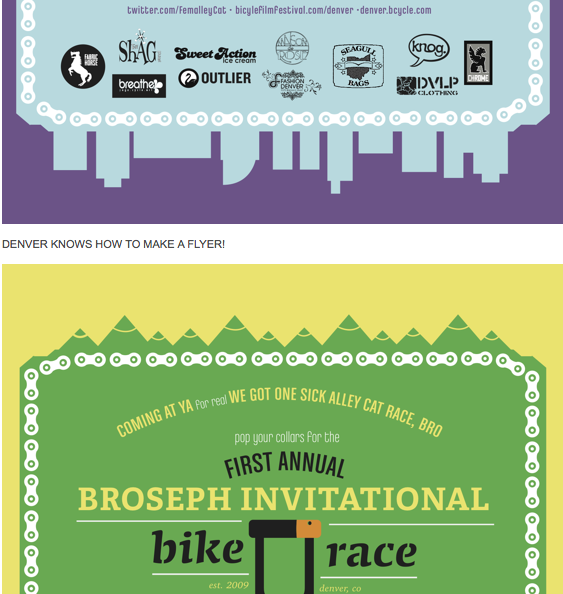 Boys racing the Broseph Invitational, we’ve got events for you too, like Best Trick and a Wet T-Shirt Trackstand contest. You might wanna bring an extra shirt. After all that goes down, we’ll be heading to the Starz FilmCenter at the Tivoli on the Auraria Campus for the Bicycle Film Festival’s showing of The Cyclocross Meeting at 7pm. Buy your tickets soon, they are selling fast! $10 bucks gets you in. Prizes at 8:30pm after The Cyclocross Meeting. Hang out afterwards for the Urban Bike Shorts screening at 9pm. Same deal, $10 admission. Buy your ticket early! The weather looks awesome for Saturday. Makes sense, since we live in Denver! Bring a bag, a lock, hydration, and some snacks. And your A game. Ride what you got, or rent from BCycle – http://denver.bcycle.com/ They are everywhere! We just want you to have fun, and to give away all this great swag we got from our amazing sponsors. If you’ve raced before, you should come ride. If you’ve never even thought about racing before, you should definitely come ride!! Handcrafted earrings from Denver’s own Baily Rose for the first 15 ladies to register for the race (yo, it’s THIS Saturday!). Baily is also a returning rider from last year’s Femalley Cat! We’ve got some high quality, fashionable, wearable gear designed for urban cyclists from our friends at Outlier Tailored Performance. Their Women’s Daily Riding Pants are killer, and one lucky Femalley racer will be going home with the new Ultrafine Merino Tanks! 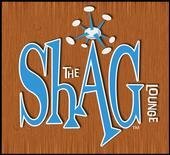 Shag Lounge is supporting us with bar tabs! 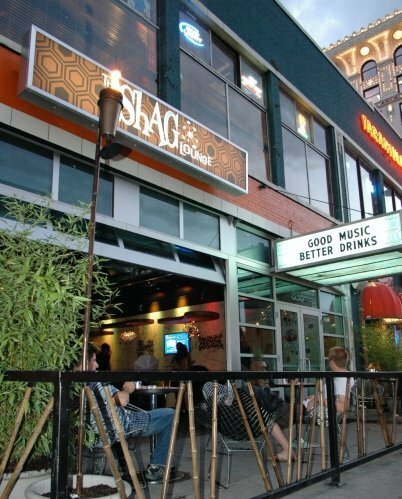 Not only is Shag one of the checkpoint locations, they are also hosting a party for the Bicycle Film Festival this Thursday. 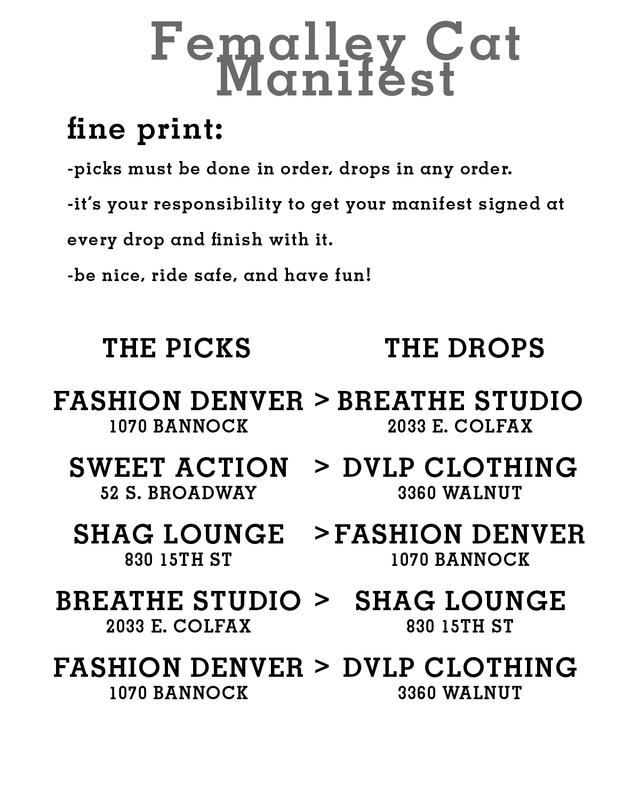 Check ’em out at 830 15th Street, Denver, CO 80202 between Stout and Champa, and show off your skills at GoldSprints! See you girls on Saturday! !